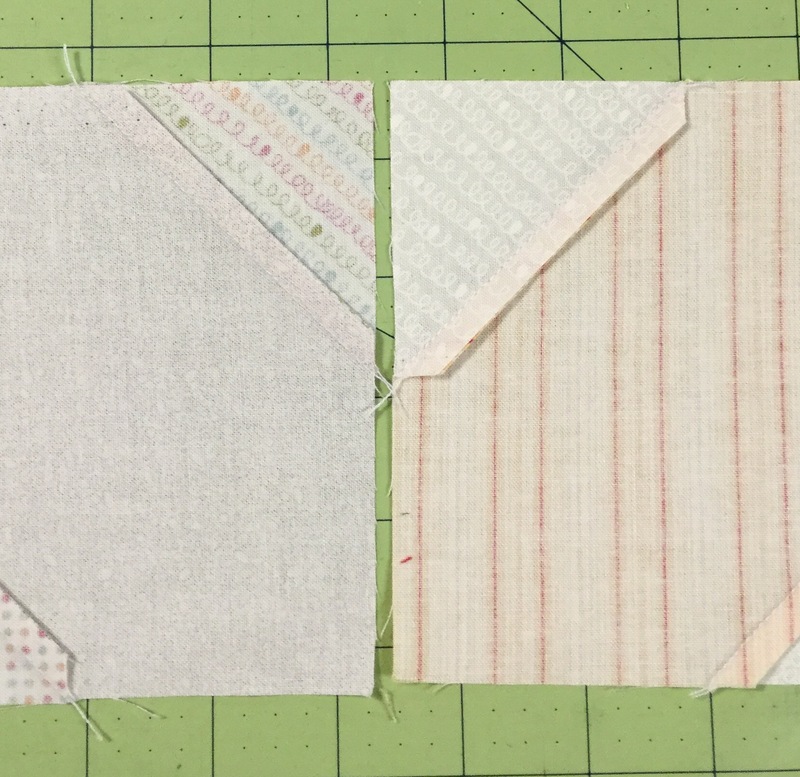 Last week, I showed you these pieces that I had cut for a baby quilt. The squares actually need further cutting and to do that, I am using this nifty tool. I cut my triangles to finish at 2 inches. With the corners nipped, this can be done with a 2 1/2 inch strip. So I place this tool on the square so that the top edge and the 2 1/2 inch marks are aligned with the sides of the square. 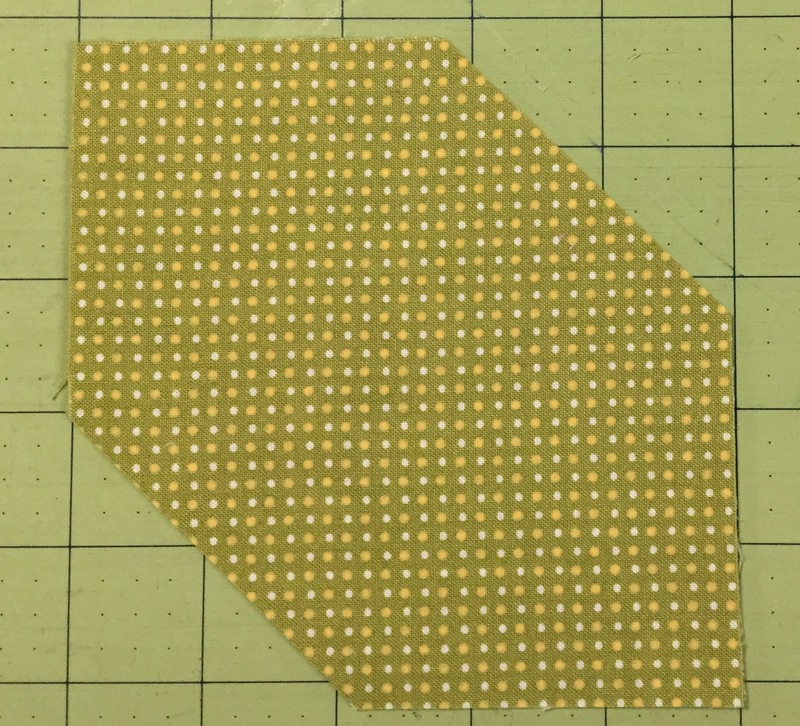 I use my rotary cutter to cut off the two corners like this. See how nicely the triangles fit now? It only took one track of my audio book to trim these up. See those little left over triangles? I swept them into the bin! 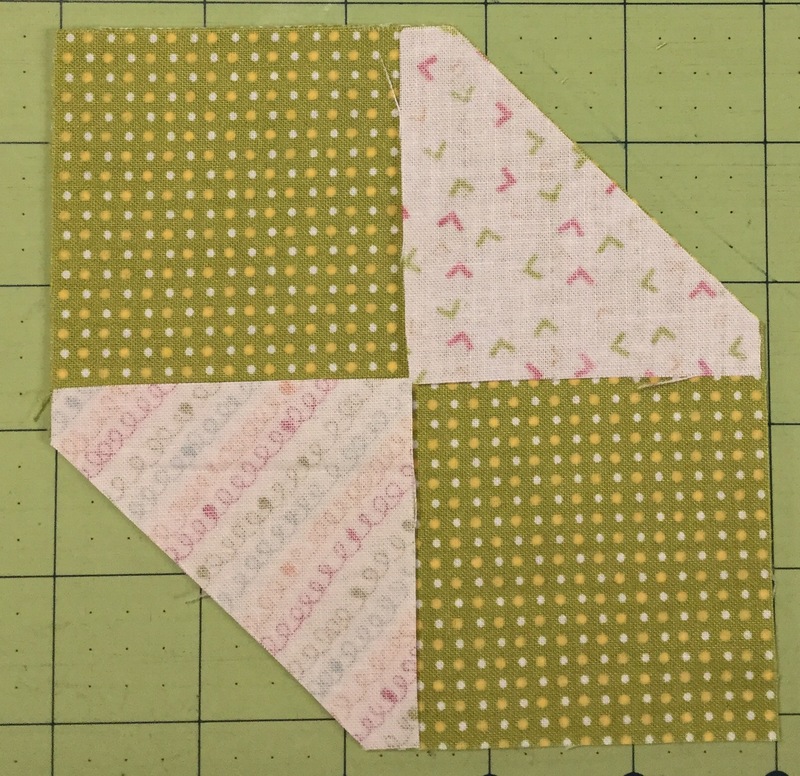 Here is a pieced block. And this is how I press my seams. One towards a triangle, and one towards the middle piece. 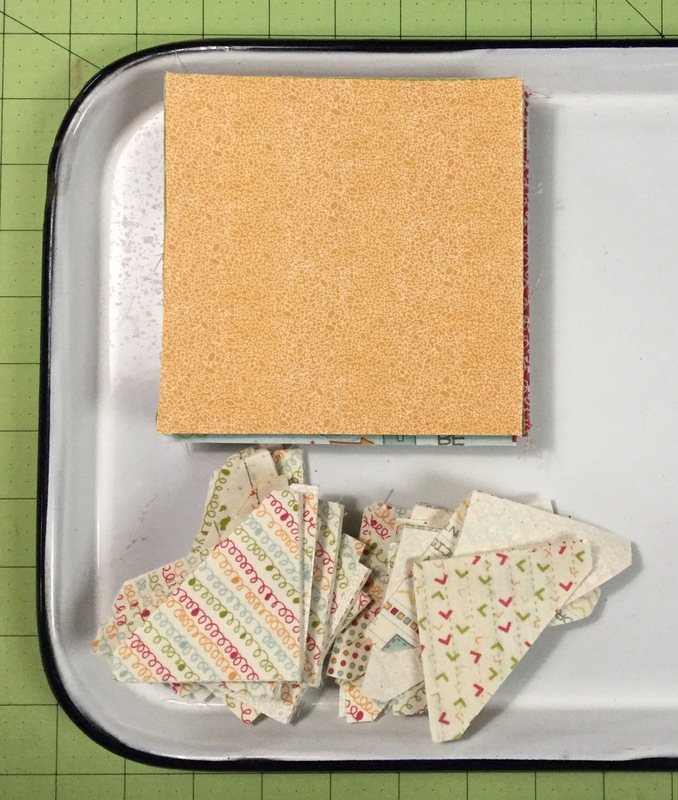 This way the blocks can be arranged so that the seams all nestle together neatly when piecing. This is the arrangement I am going for. I have quite a few more blocks to go so I best get moving! 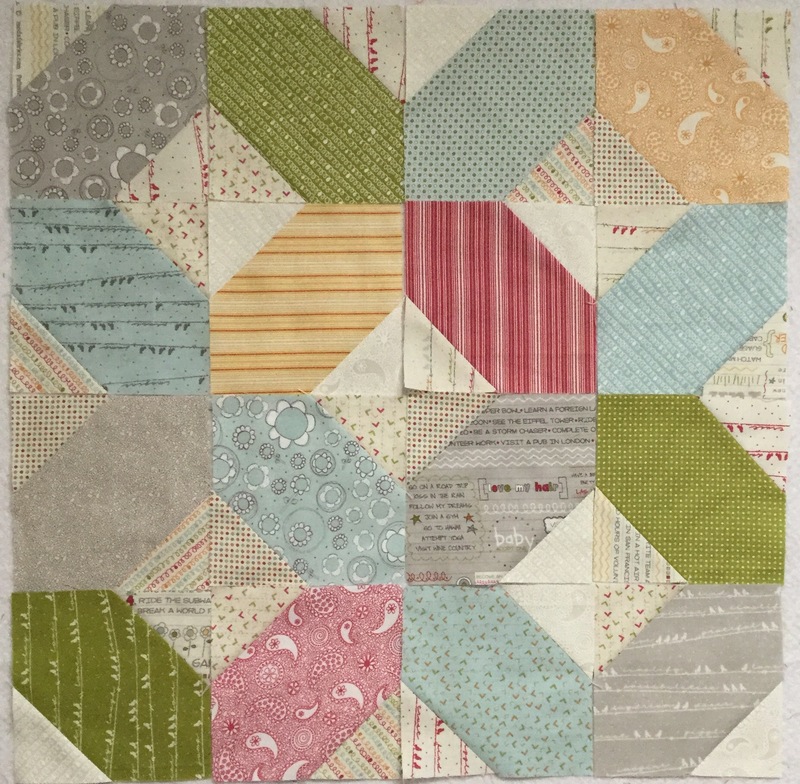 This entry was posted in Baby Quilts, Design Wall Monday, Uncategorized. Bookmark the permalink. I’ve never seen that tool before. It makes a very interesting block. 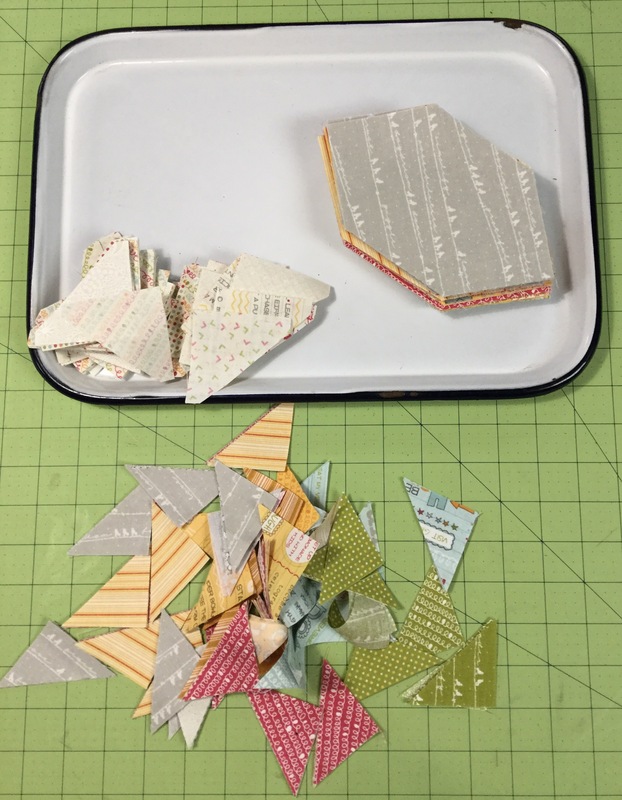 Were those triangle pieces cut with an accuquilt die? I like the colors you are using Katy, and look forward to seeing it all together. Thanks for linking to MCM! Looking very pretty! It’s a version of the old doughnut pattern, yes? I purchased this Clipper Tool last month and am looking forward to using it. Thanks for the clear description of how to use it. The modified square coupled with the trimmed triangles makes sense to me! I am looking forward to sewing without frustration. Thanks! That is a nifty little ruler. 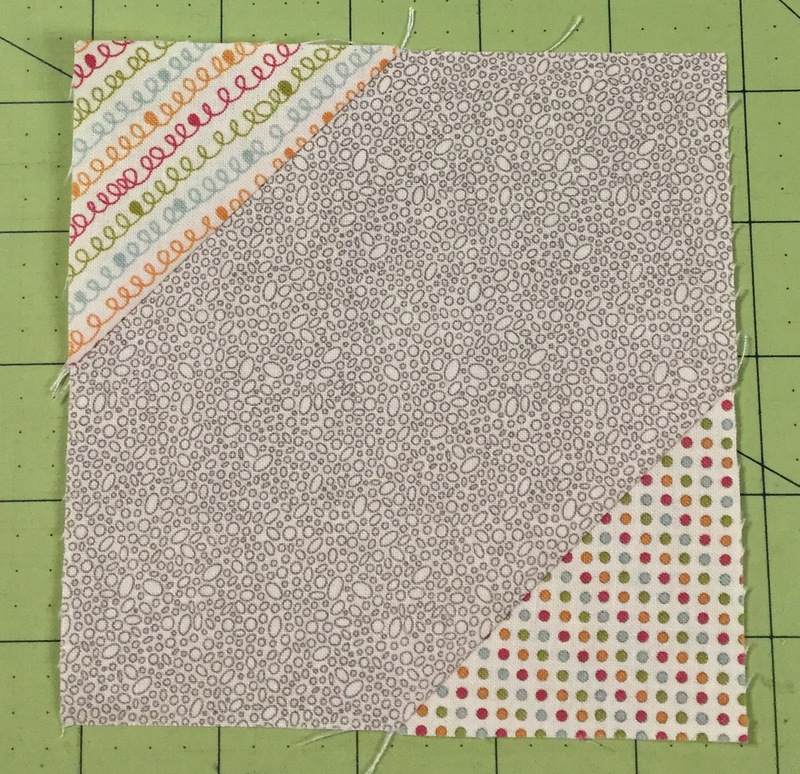 Cute fabrics for a baby quilt. This triangle is magic ! I didn’t know it !! 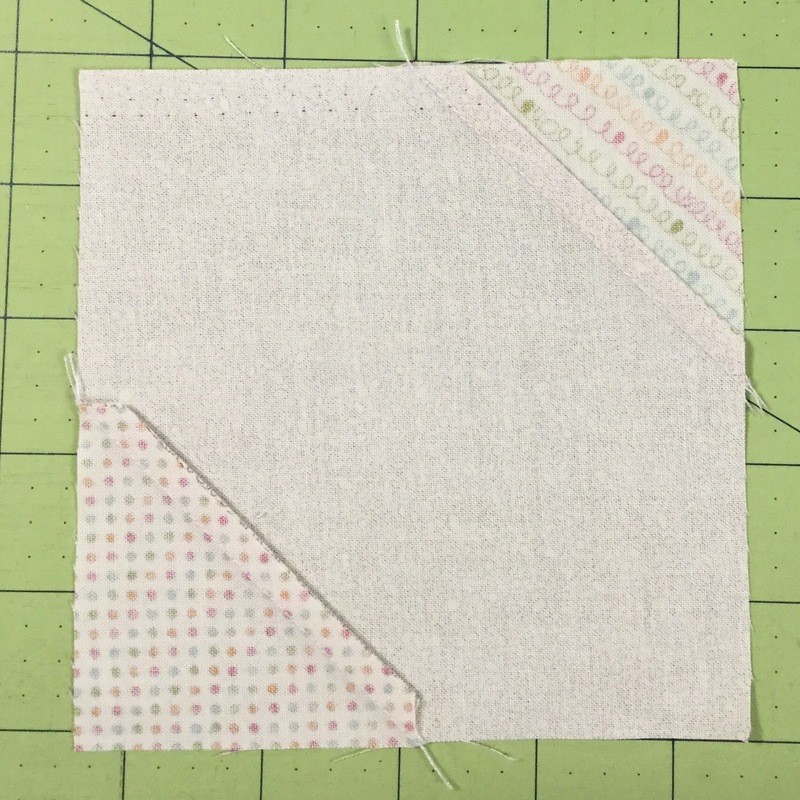 Love your baby quilt and its colours ! Thanks for the great tute. I have been avoiding this pattern, but your steps show how easy and accurate it is. 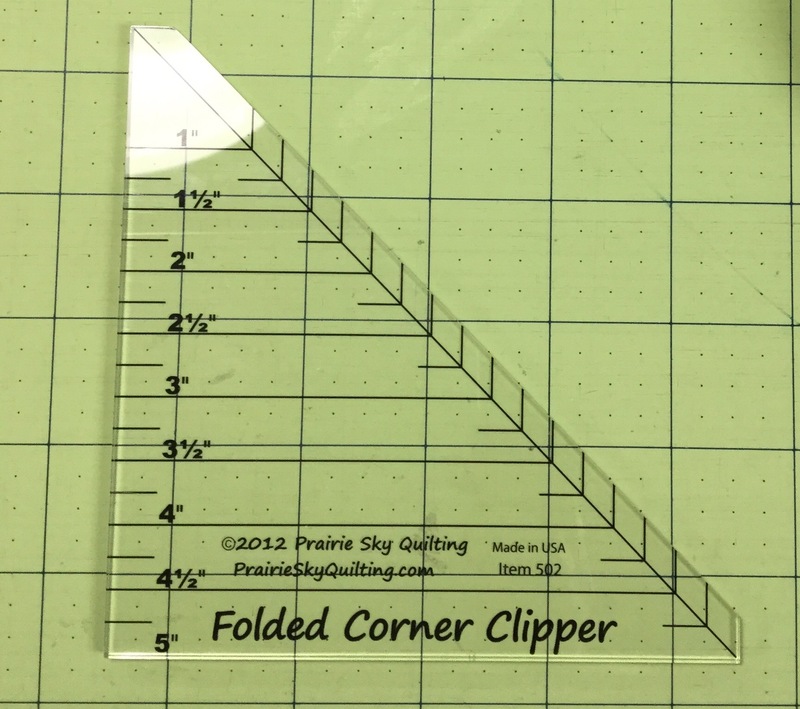 I’ll have to check out that ruler for myself at Prairie Sky. Thanks again. What a nifty ruler. Can’t wait to see more of this project. What a great tool! 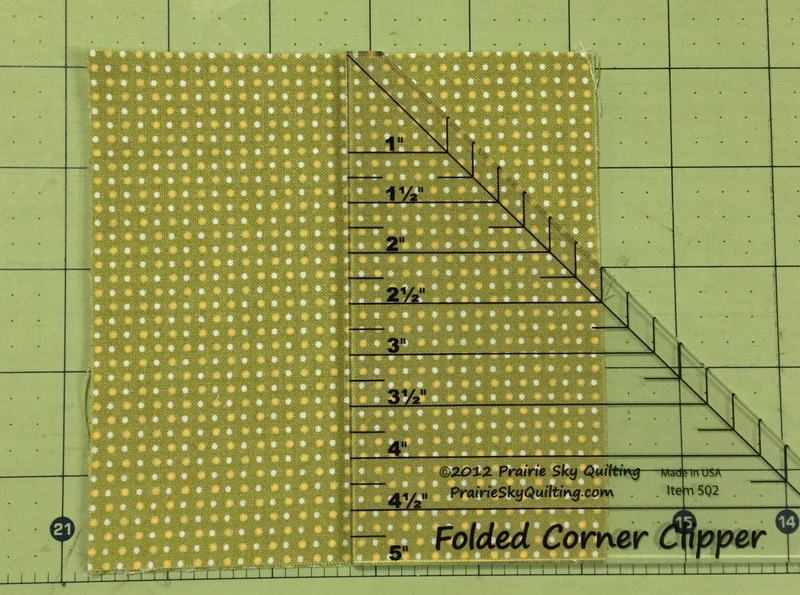 I have a piece of tape on the bed of my sewing machine to guide that center line, but very often I’m a wee bit off. The clipper tool may be just the thing. I will now go look it up. Interesting technique! Thanks for sharing. Very cool method! Love the result. This will be a most lovely quilt! Thank you for showing how you make it!